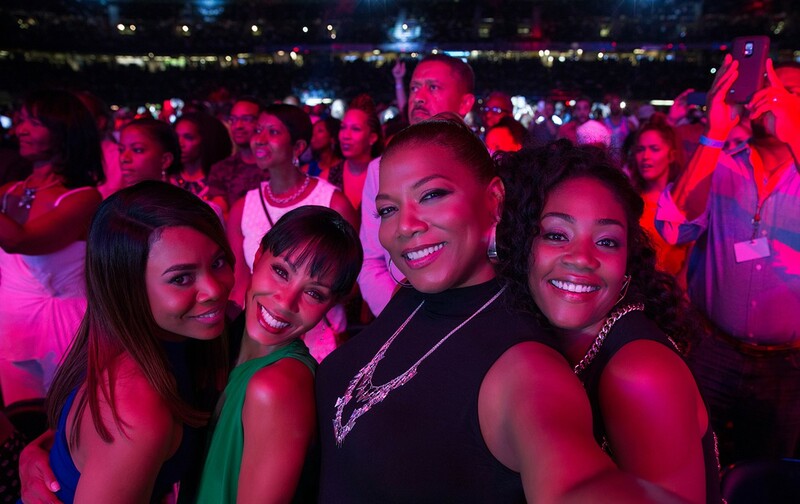 Regina Hall, Jada Pinkett Smith, Queen Latifah, and Tiffany Haddish in "Girls Trip." Coming hot on the heels of recent disappointing "women-behaving-badly" comedies "Snatched" and "Rough Night," "Girls Trip" succeeds in showing those films how it's done. The movie gives its audience the raucous comedy and heartfelt emotion that those films promised, but only sporadically delivered. "Girls Trip" follows four women, old college friends who've fallen out of touch over the years. Ryan (Regina Hall) is a successful self-help author and lifestyle guru; Sasha (Queen Latifah) is a former journalist turned gossip blogger; Lisa (Jada Pinkett Smith) is the uptight, divorced mother of two; and Dina (Tiffany Haddish, in what deserves to be a breakout role) is the group's wild card and dirty-minded free spirit. When Ryan is invited to New Orleans to be the keynote speaker at the Essence Festival, she invites her "Flossy Posse" along for the trip, giving them the opportunity to reconnect and let loose. Along the way there's plenty of raunchy hijinks, but as the booze begins to flow, old grudges resurface and each woman has the opportunity to reassess things, including Ryan's seemingly picture-perfect marriage that's crumbling under her husband's philandering ways. The film's biggest asset is the fantastic chemistry of its four funny stars. Malcolm D. Lee's assured direction allows them each their moment to shine, and they effortlessly convey years' worth of shared history together. "Girls Trip" has no aspirations of high art, but like the characters at its center, it just wants you to have a good time.